I have installed ArcGIS Server 10.1 on Node01 and Node02 and both are accessing ArcGIS Server directories from local drive. 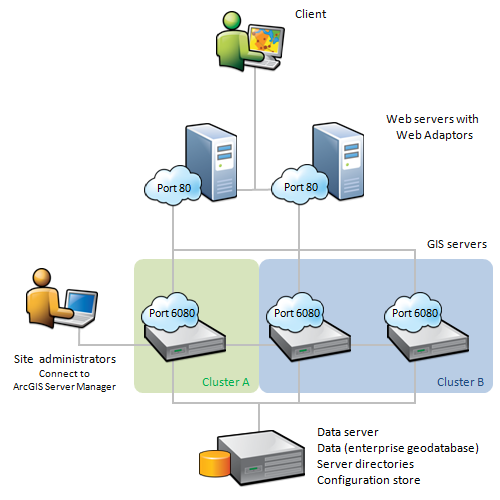 Both nodes have exact same configuration in terms of Services and ArcGIS Server Admin user. I have Web Adaptor installed on both nodes as well. Both nodes are onto one cluster and we are using Windows 2008 Cluster. When i connect to Cluster by typing "http://Cluster name/arcgis/rest/services", i can see services installed on Node01 since it's an active node for this particular cluster. Is this a correct way to configure ArcGIS Server 10.1 for failover. And what extra settings you need to do within Windows Cluster to test ArcGIS Server failover scenario? you could create a single site with two gis server (in node active and in node passive). You store configuration directories in a SAN so you have a single configuration. I haven't tried this configuration but I check in next days. Thanks ciava for the input. I agree, we may have to run configuration directories from SAN and ask both Nodes (ArcGIS Server) to use the directories from SAN. SO for Web Adaptor, can one Web Adaptor be configured for two ArcGIS Server URLs or they can run independently for failover scenario or do we need to introduce third machine (Node03) in cluster which only has Web Adaptor configured to connect to Node01 and Node03? Thank you for the links about Windows Cluster set up. I will discuss with our network guy to go over these links. In Cluster, do i have to put the path for ArcGIS Service exe to failover to another Node within cluster? ags 10.1 with multiple machine site is also appropriate for sites that cannot afford to have any downtime. If a GIS server goes offline, the other GIS servers can keep the site running so you have HA. In your particular case you have one site (configuration in san) with two gis servers where one is active and another passive. web adaptor connects to site. can you please elaborate more on how to make two arcgis servers on two machines active/passive share the same configuration files on SAN storage? In node B have you in this file C:\Program Files\ArcGIS\Server\framework\etc\config-store-connection.json that connect SAN path? In actions of cluster have you add 'start service arcgis'? yes, ArcGIS server Windows service is setup in the cluster failover manager. copy security folder only from previous site to maintain users and roles etc..
publish services so our system is up and running.